If there is one thing that I keep in my pantry at all times, it is some form of pasta. I’m certainly not Italian, but I think it’s the one staple that my family could never give up. Since my children like pasta, I find myself making more and more family-friendly pasta meals that can be ready in a short amount of time. A favorite cookbook of mine that I use quite frequently is a collection of recipes from the Junior Guild of Rocky Mount. After owning the cookbook for years, a pasta dish recently caught my eye for the first time. It turned out to be a simplicity winner. For this simple meal, I used penne pasta as the recipe suggested, but you could easily substitute spiral, bow tie, or ziti pasta. 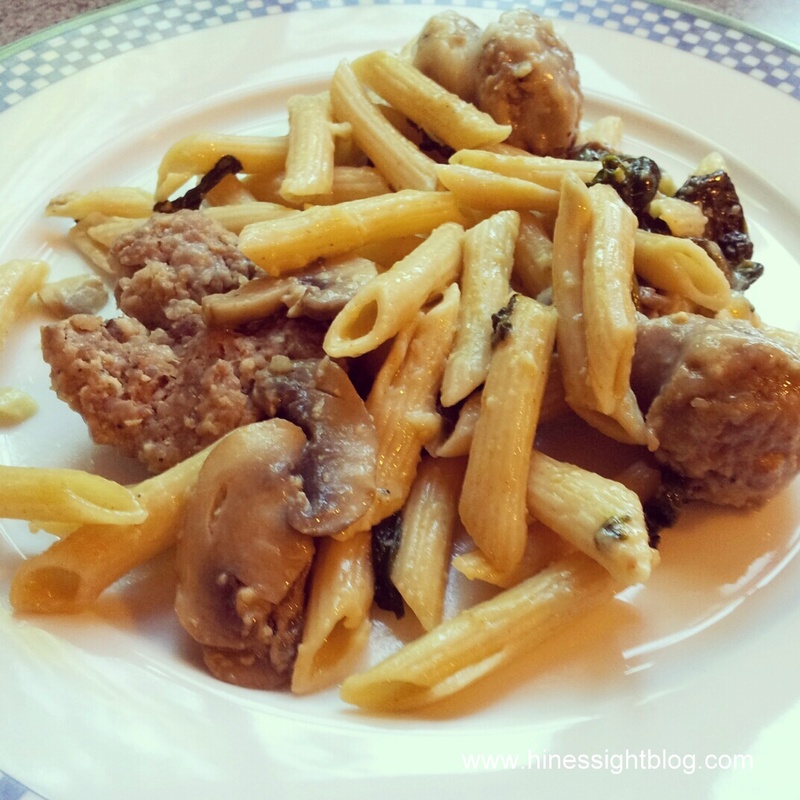 The star of this pasta dish, in my opinion, is sweet Italian sausage. It adds some zing and zang to a dish that would be just an ordinary, boring pasta dish without it. When you add mushrooms and spinach, you’ve got an entire well-rounded meal in one big ol’ pasta bowl. Cook pasta according to directions. While it is cooking, heat oil over medium-high heat. Add sausage, mushrooms, shallots, garlic and crushed red pepper. Saute about 10 minutes or until sausage is cooked. Add spinach and broth. Cook, turning spinach over, about 2 minutes until spinach wilts. Add cooked pasta and cheese. Toss until cheese melts, and sauce coats the pasta.